Four full-size tuna tubes fed by 3700gph bilge pumps each side. Removable wave-deflector transom door. 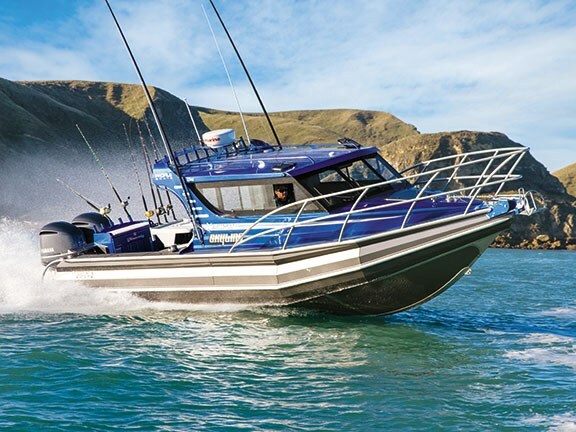 Skyline Charters wanted a big, tough, stable, capable, impressively finished and fully tricked-out fishing weapon to wow their clients while fishing the fertile waters off Tairua. Owner Sky Mason put his faith in the highly-skilled team at Profile Boats. That faith was placed in good hands. After being impressed with the pure X-factor of the golden 900HW (see our August 2012 issue), and following discussions with Firmans Marine, Mason commissioned Profile to build the very first of their new flagship model, the 940HW, straight off the plans. It was a leap of faith, given the investment, but it's a decision Mason's very happy with. He describes the design and build process as "a great experience" and speaks highly of the professionalism, knowledge and level of service received. In fact, Mason's more than impressed. 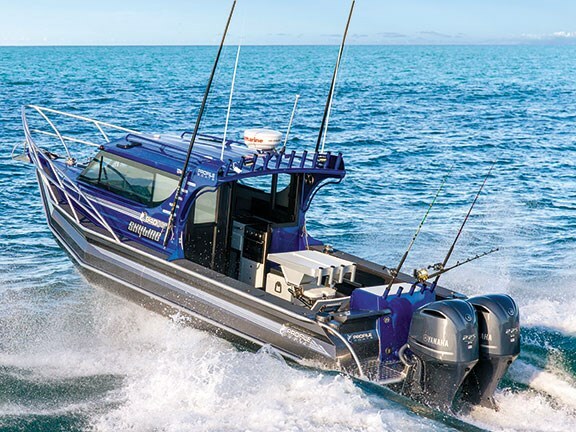 "I wanted to have the ultimate fishing vessel and the team at Firmans have pulled through wickedly — they've absolutely blown me away," he says. With her 'Viper Blue' and gunmetal grey paint job, Skyline attracted plenty of fans at the 2013 Hutchwilco Boat Show and, being only a few booths down from the Trade-A-Boat stand, I found myself daydreaming about her on more than one occasion. Luckily, dreams can come true, and it was hard to act professionally when the flights to Napier arrived in my inbox — apparently there was some 'work' to do. When the test day finally arrived, Napier turned on a cracker. Crystal-clear skies, a solid two metres of swell and fifteen knots from the north-west provided a decent playground for Skyline to showcase her skills. We left Ahuriri in our wake and plotted a course for Flat Rock, which, as luck would have it, was also where the swell was getting a bit testy. Firman suggested it would be a good idea to try and get some air off the swells for photographic purposes, which seemed insane with a five-tonne boat. What happened next is the stuff magazine cover shots are made of: a combination of timing, driver skill, a big set and a seriously well-built boat resulted in 9.4 metres of aluminium battleship fully airborne with only the props still wet. And the landing? While I was behind the camera at the time, the big pontoons excelled and there is photographic and video evidence to prove she came down straight and true and simply kept on going, completely unscathed — even with the side windows open. After that impressive display, I had absolutely no reservations about getting in the hot seat. For a big, solid boat, Skyline is quick and inspiring to helm, with twin Yamaha 225hp V6 four-stokes dishing out some serious grunt. At WOT she's capable of an impressive 42 knots at 5850rpm, burning 152 litres per hour. Easing back to 4000rpm sees 25 knots for 74 litres per hour, and she'll troll all day long at 1500rpm for 7.5 knots using 12 litres per hour, which will go a long way with 500 litres of fuel on tap. Twin screws mean Skyline is manoeuvrable for her size, with the benefit of redundancy in the unlikely event one shuts down. Rest assured you'll still get home in good time, as we recorded 28 knots while running on one outboard at 4400rpm. The Profile team takes its fishing very seriously, which is evident in the precisely laid out and superbly functional cockpit. 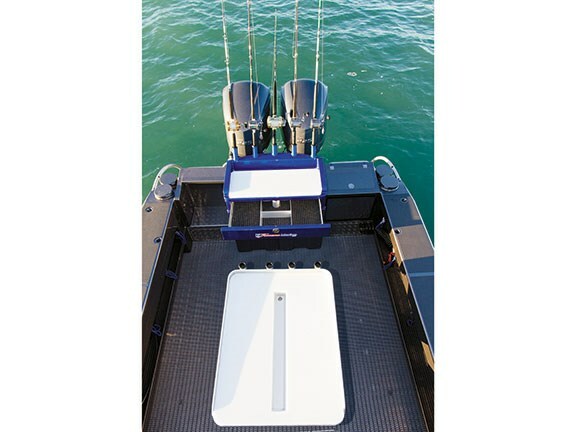 You can rig up with ease thanks to the large bait station with its tackle/lure drawer underneath and five rod holders across the back. Close to hand is a sizeable live-bait aquarium with a soothing blue light. Four full-size tuna tubes are fed by large capacity 3700gph bilge pumps each side. 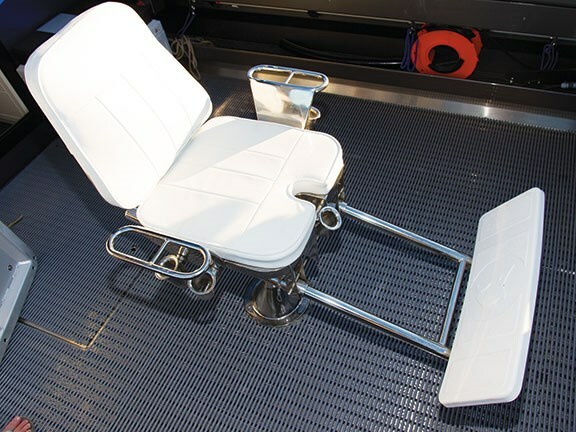 Taking centre stage is a Cyril game chair that, when not being put to good use by an adrenaline-fuelled angler, acts as a mount for a second large bait board with a further four rod holders, again for easy rigging. All the rod holders (there are 27 in total) are heavy duty, with the eight in the gunwales precisely angled for trolling. Lugs and lanyards have been fitted for securing game rods. Profile's wave-deflector transom door features an arched back to turn the sea away when backing down on a runaway trophy. Underwater LED lights provide an attractive glow to entice the live baits before dawn, while LED cockpit lights and spotlights keep the cockpit glowing. 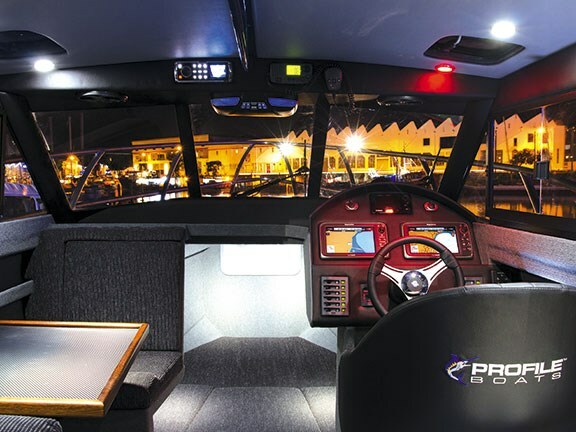 Profile has cleverly redesigned the pontoons on its 635, 750, 780 and 940 models to create toe space in the cockpit. This offers a secure stance for a big advantage when hooked up to a freight train, and distinguishes Profile boats from other aluminium pontoon craft. It also means the treadplate floor is 2.4m wide. Skyline is well equipped for a comfortable day of action, with 250 litres of hot or cold water on tap and a full galley, including a three-burner gas hob, oven, fridge, sink and ample utensil storage. There are also clever little touches that make a difference, like a grab rail along the front of the bench and recessed cup holders. I don't normally get excited by galleys, but this one looks outstanding and is nicely finished off with a dazzling glass splashback. 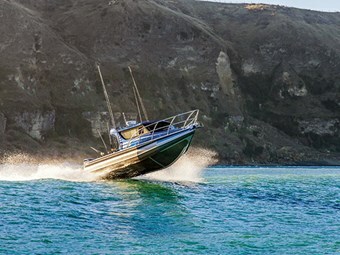 Ergonomics are faultless and, with its large bi-fold door and matching rear window opening inwards, there's a great flow between the cabin and cockpit for entertaining or keeping the skipper in touch with the action out back. Should conditions take a turn for the worse, this allows the big cabin to be completely closed off for comfort and security. Profile also utilises internally-sliding side windows to provide good ventilation. Up front, full-length front berths also include extended leg room under the bulkheads for extra length. The dining table drops down while the rear-facing seatback reclines to create a third king single berth, allowing overnight capabilities for three — or four if you're friendly enough. The inclusion of a separate toilet and shower cubicle allows privacy and means hot showers can be enjoyed straight after a dive, while the wet gear stays in the cockpit where it belongs. A large underfloor bin will capably stow the gear or chill the catch. Relaxing into the comfortable and adjustable soft-rider helm seat provides an excellent view through the safety glass windows, while the eye-candy dash, with its classy vinyl trim, is laid out before you. 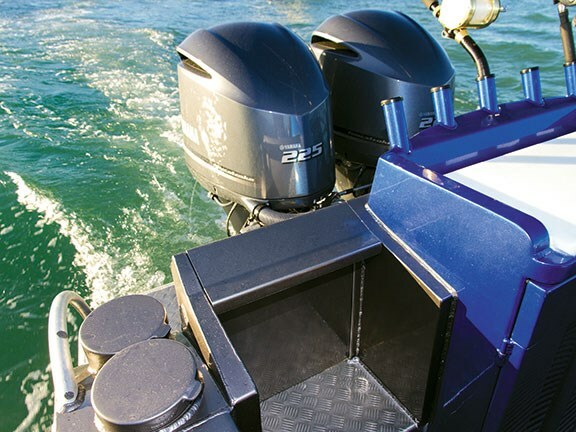 Ultraflex adjustable-strength power steering makes time on the helm all the more enjoyable — you can lighten the load while trolling, or beef it up for blasting home at speed. Skyline is also equipped with an autopilot and a freshwater wash system on the wipers so the skipper can relax and enjoy the scenery. Speaking of views, the oversized 'don't mess with me' bow rails are a custom option, and while they may look like they'd obscure the skipper's visibility at the helm, they've been designed for minimal impact. The optional automatic capstan and double fairlead afford easy anchoring and securing of mooring lines. Twin 10-inch HybridTouch Raymarine screens with radar and Chirp Downvision technology, plus the latest Fusion MS AV700 stereo system and Bluetooth interfaces, provide a wealth of information and outstanding functionality. These can be controlled and displayed on a tablet or smartphone from the cockpit. Skyline has a tow camera and cockpit camera to capture all the action and provide clients with a lasting memory of their fishing trip. She's also got a subwoofer, amp and six speakers to bring up a marlin or two, and a DVD entertainment system in case the fish go off the bite. While being able to tow a boat of this size home is a nice option, it goes without saying that, at just shy of five tonnes on its Profile tandem-axle trailer, Skyline requires a serious tow vehicle (we used a small truck) and, at 2.73m wide on the trailer, flags are mandatory. Driving her on and off for our test was a straightforward exercise, but a suitable ramp is also required. Profile Boats has lifted the bar even higher with its new flagship model. It's as impressive in its presence as it is in functionality, fishability and wave-defying ride. The level of features and customisation that the talented team at Profile has managed to seamlessly integrate into this boat speak wonders for the knowledge, can-do attitude and devotion to customer satisfaction that only a passionate team can deliver. In short, the new 940HW is big, ballsy and quite possibly capable of catching any fish, any time. 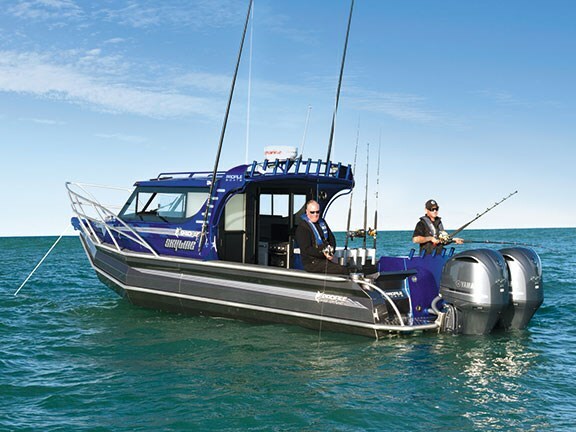 For more information contact Firmans Marine Centre on (06) 835 9718, email sales@firmansmarine.co.nz or visit profileboats.co.nz.